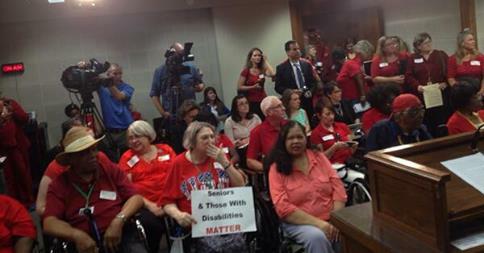 Last week at the legislature was a whirlwind and it was great that many of you showed up to advocate! On Tuesday, we rallied with the Coalition on Aging to tell Senators how harmful their budget was to aged, blind and disabled North Carolinians and to tell House members not to concur with the Senate budget. Following visits with legislators, we gathered for a press conference that got so much media attention regarding our theme of Seniors and Those With Disabilities MATTER! You can read about it in the News and Observer and WRAL. On Wednesday, we came back with a different coalition to tell legislators to Expand Medicaid. This event even made National news! And on Thursday, we met with advocates and legislators for Erin’s Law to begin discussions to create an inclusive and appropriate ending to child sexual assault in NC. Since the Senate worked last Friday and Saturday, they did not return to Raleigh until Wednesday night. This allowed the House to have budget discussions and review the Governor and Senate proposed plans. We anticipate a House budget this week with another Friday/Saturday session to approve their plan. Following the House budget vote, a conference committee of Senators and Representatives will be selected to merge the Governor, House, and Senate budgets into one final plan. HB 1104 Study Oversight/Conflicts of Int./Foster Care: This bill requires the Health and Human Services Committee to study oversight of DSS, conflicts of interest within DSS and how to address these issues. The bill comes from the Foster Care Committee that NASW-NC attended during the interim legislative session. The bill passed the house with no objections and was sent to the Senate. HB 1110 Improve Oversight of Public Guardianship: This bill requires DHHS to improve the public guardianship system efficiently within Child Welfare and the Division of Aging. The bill also directs DHHS to study whether utilization of care coordination services could provide needed oversight to safeguard against conflicts of interest when guardians serve as paid providers.The bill passed the House and was sent to the Senate. Moral Monday will focus on Education: Standing up for our Teachers, Students and Children at 5pm at the Halifax Mall (behind the legislative building), 16 West Jones Street. Child and Family Day: Tuesday, June 10th at 9:30 am. Register online! Games and events for children and adults! These legislative updates are provided by the National Association of Social Workers. 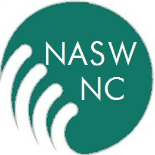 North Carolina Chapter (NASW-NC). NASW membership support advocacy efforts on behalf of social workers and their clients at the state and national level. Become a member of your professional association today by joining online at www.socialworkers.org. This entry was posted on June 9, 2014 by naswnc in Advocacy and tagged Advocacy, Legislative Session, Legislators, macro practice, macro social work, Medicaid Expansion, naswnc, Short Session, social work.